With the coming of midsummer, China gradually enters the rainy season. Due to the intensive rainfall in Jiuzhaigou County in Sichuan Province, the Jiuzhai Valley National Park has been closed since July 1, 2018. Of course, it’s not alone. On June 30, 2018, 11 tourists, including three Americans, were trapped in Mutianyu Great Wall in Beijing due to the heavy rain in the dark evening. In Yunnan Province, the Yuanyang Rice Terraces suffered from a landslide caused by constant rainfall on June 26 and the Laohuzui (Tiger Mouth) Scenic Area was closed temporarily. Looking back a few days, the Mt. Laoshan in Qingdao City of Shandong Province was also closed for heavy rainstorms. However, the rainy season is not an obstacle for your travel to China. In fact, if you plan well, you can still get an excellent travel experience because of refreshing air after rain and brighter colors of mountains. 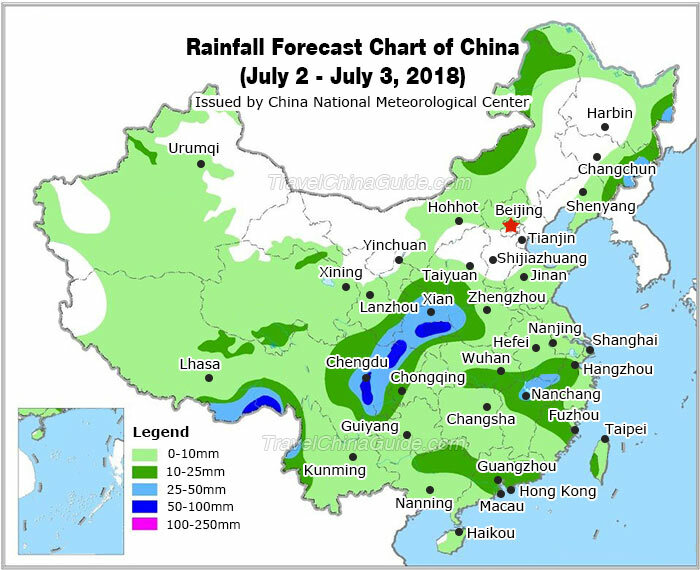 When is China’s Rainy Season? China’s rainy season always starts from mid-April and gradually moves northward from the southernmost China. Therefore, for different parts of China, the rainy season falls in different months. For southern cities, the rainy season comes and ends earlier, while for northern cities, it’s later. Here we list the months with the most rainfall for some major destinations. Abundant rainfall makes the air quite wet, therefore, quick-dry base layers are a must. You may also bring some drying agent to keep your clothes dry. Umbrella and raincoat are necessary. Rain boots are not advised because they take up too much space in your luggage. You can take a pair of skidproof and waterproof shoes instead. 1. Check weather forecast before taking outdoor activities. This is the primary thing to do before making your next day travel plan. Light rain usually does not influence your trip, however, if you go to mountainous regions or waterside attractions, it’s better to cancel your plan or just put it off. 2. To prevent rainstorms from ruining your China tour, you need to make a backup travel plan. Set aside some indoor activities, like visiting a museum, gallery, aquarium, etc., as an option if it’s forecasted to rain. 3. Try to choose trains as your prior option of transportation. Compared with planes and buses, trains are usually less affected by weather. If travelling in China during the rainy season, trains can better guarantee your trip.